Viewing of immersive virtual reality images and video content through various apps and YouTube. Prices range from $1.00 to over $25.00 depending on cardboard or plastic body, overall thickness of materials, and features such as face piece padding and adjustable head strap. 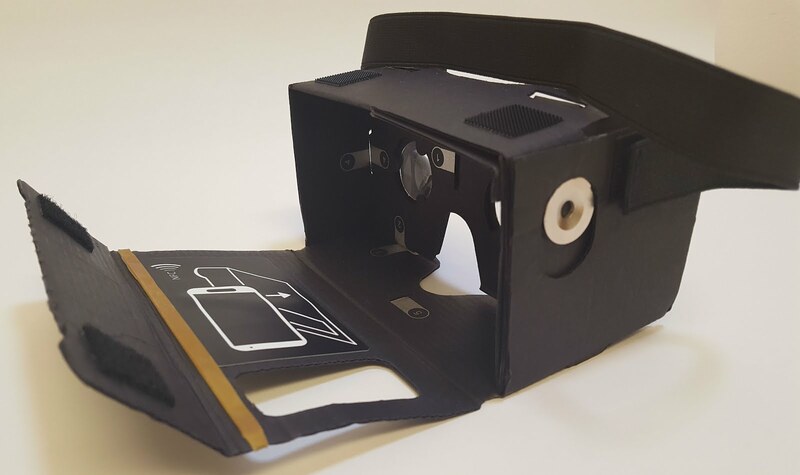 The D-Scope, as with most Google Cardboard devices, comes as a flat piece of cardboard. The user assembles the device by breaking apart the pieces and assembling using instructions imprinted on the cardboard surface. Once assembled, the user opens the back of the device and inserts a smart phone, securing the phone with an included rubber band. Velcro is used to close the cardboard back to further secure the smart phone. Virtual reality images and video can then be viewed through the binocular-style lenses embedded into the device. A metal washer and magnet on the side of the device can assist in screen navigation but compatibility with smart devices is limited. Our time with the D-Scope was mostly positive. The device was easy to assemble using the instructions clearly stamped on the cardboard surface. The fit of the tabs into the cutouts was good but not great, with some bulging noticed at the bottom seams. However, the device never came apart during use. The D-Scope also came with a rubber band for securing the smart phone into the back. Larger devices, such as plus-sized Android and iPhones could not be used in this standard-sized unit but larger Google Cardboard devices are readily available for purchase. 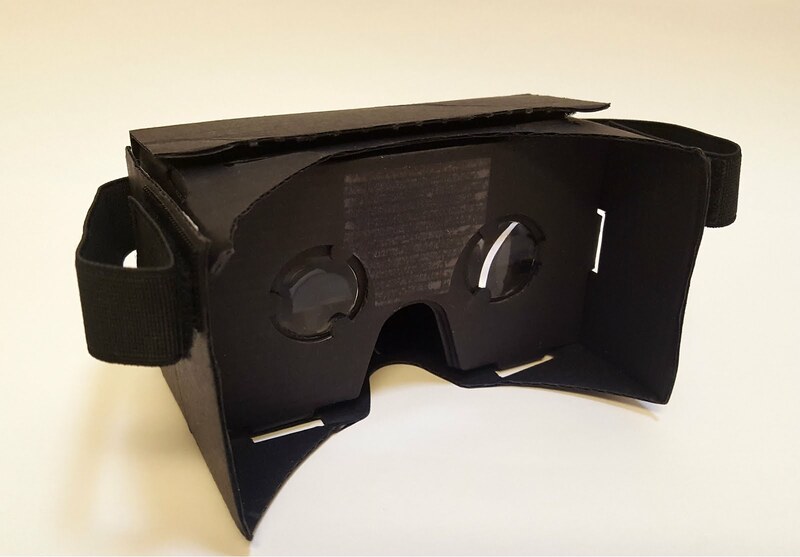 Once assembled, content was accessed through the smart phone through several apps including YouTube VR, Google Cardboard app, and general content found by searching for Google Cardboard VR. The initial experience when viewing virtual reality content is breathtaking. The user is surrounded by the viewed environment and can turn 360 degrees both horizontally and vertically. 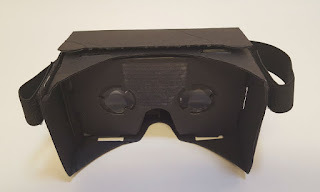 Lenses on the Cardboard were adequate to create a clear image however positioning of the phone within the unit was key to maintaining a balance between left and right eyes. The rubber band assisted in keeping the phone positioned correctly but at times overlapped with the viewing screen. Rubber band would sometimes overlap the viewing screen. Cardboard construction made it susceptible to damage, possibly leading to a short life span. 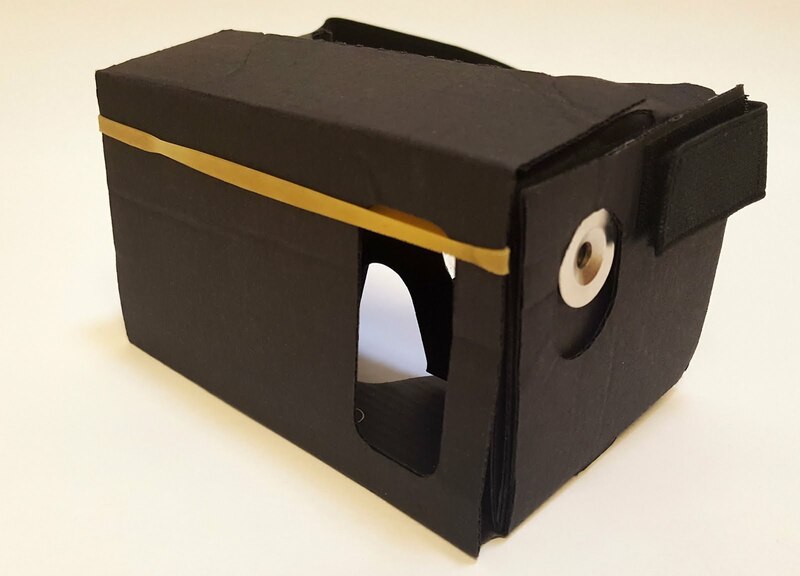 Google Cardboards provide a simple and inexpensive way for introducing virtual reality content into classrooms and the D-Scope was certainly a capable performer. Instructors can easily search for relevant content for virtual field trips to art museums, archeological sites, astronomical locations, hospital rooms, physical therapy procedures, and similar. And inexpensive immersive cameras such as the Ricoh Theta allow instructors to create their own content. Overall, the D-Scope proved to be an adequate performer for the money but note that cheaper options are available. Yoder, M. (November 27, 2015). Virtual reality in the classroom just got affordable. International Society for Technology in Education. Retrieved on June 23, 2016.